Inlanta Mortgage Partners - October 2012 - Inlanta Mortgage, Inc.
What Do Loan Officers Want? Hammerhouse, LLC recently released the results of their 2012 Loan OfficerCore Business Components Study. The online survey asks hundreds of mortgage originators their views related to the core business components of residential mortgage lending including leadership, culture, business, operations, technology, and geography. Some of the results are startling. According to the survey only 18% of mortgage originators describe their firm’s communications as clear, consistent and on time. Inlanta Mortgage prides itself on maintaining open lines of communication. Originators are provided with a number of tools to ensure open and clear lines of communication to ensure a smooth loan process for each and every customer. One of the tools Inlanta utilizes is a secure instant messaging system which allows employees to share sensitive customer information instantly. Other communication tools include a scenario engine which allows originators to ask underwriters questions about tough loan scenarios and to determine the best way to proceed. In addition, Inlanta provides every employee with access to our Inlantr@Net – our company intranet, a monthly newsletter detailing important department issues, and standard email groups that enable all employees to communicate with whole departments or groups of people. According to the survey, only 33% of originators think their leader’s vision is inspiring, clear and highly motivational. While Nicholas J. DelTorto has been in a leadership position for many years, he was recently been promoted to President at Inlanta. As President, DelTorto frequently communicates his vision through timely emails, personal branch visits, corporate functions, and through our monthly corporate newsletter. A thirty-year industry veteran, DelTorto understands the mortgage industry’s new environment and what it takes to thrive. He consistently seeks to align the company with ethical and professional originators who understand Inlanta’s vision – to survive and thrive through ethical lending practices and a comprehensive support platform that allows originators to do what they do best – originate. On a final note, the survey revealed that only 54% percent of loan originators like their jobs and only 45% percent think their firm is positive and team-oriented. Inlanta Mortgage continues to encourage cooperation and collaboration between partner branches and corporate headquarters. Inlanta loan officers can reach out to their colleagues when it comes to tough loan scenarios or to share interesting marketing ideas. Click to hear what our branch managers have to say about working at Inlanta Mortgage. Are you contemplating a move from your current company? There are many things to consider as you evaluate your options. What type of questions should you ask your prospects as you contemplate this business decision? Do you offer a pricing engine that shows me the transparent investor options or does it hide the investor? Do you offer benefits such as health/dental care, life, disability, flexible spending accounts, etc.? What about a 401(k) and match program? Do you have a funding department? Do you have delegated underwriting? Is there a marketing department available to assist me in finding ways to generate business and design a customized marketing strategy? The mortgage industry has undergone many dramatic changes over the course of the last few years and Inlanta Mortgage has survived and thrived through a balanced approach to production and profitability. Inlanta Mortgage is effective and efficient in structuring and assimilating other mortgage operations with minimal disruptions to business. This is consistent with Inlanta Mortgage’s focus on an honest, ethical and financially sound business model. Inlanta Mortgage was pleased to receive both the Mortgage Technology Top Tech Savvy Lender Award and a Top Workplace Award in 2012. View our video testimonials on underwriting, processing, technology, marketing and more here. 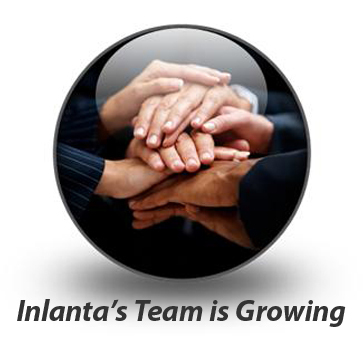 Contact one of our branch development team members at partner@inlanta.com or call 262-754-6468. Vice President of Branch Development, Joe Ramis, and Branch Development Manger, Pete Salamone can answer your questions and help you understand why a move to Inlanta Mortgage is in your best interests for long term success. Inlanta Mortgage is delighted to announce the addition of fourteen employees, including four sales and ten support staff in the past month. The company has hired 76 new employees in 2012. The Newington, N.H. branch added new Branch Manager Carol Zink-Mailloux and Jennifer St. Cyr as an administrative loan assistant. At the Manchester, N.H. branch, Jonathan Wagner joined the team as a loan originator. The Madison, Wis. branch also expanded with the addition of Loan Originator Steve Radlinger and Receptionist Samantha Warden. Other hires include: Loan Originator Mike Ponce in Oak Brook, Ill., and Administrative Loan Assistant Danna Johnson in Minocqua, Wis.. The corporate office in the Brookfield also added a number of new employees to maintain the high level of support services provided to partners and employees. The underwriting department added new Underwriter Trisha Mulder, while the funding department hired two File Document Review Clerks, Ashley Bruggenwirth and Tammy Baladraf. Clark Jester also joined the team as a government insuring specialist. Inlanta Mortgage is a multi-state mortgage banker based out of Brookfield, Wisconsin. NMLS# 1016. Inlanta Mortgage is proud to be a recent recipient of a 2012 Top Workplace Award. Inlanta Mortgage continues to seek qualified mortgage professionals for our team. Review our current job openings here. Learn more information about Inlanta Mortgage’s partnership benefits and support services. For more information on becoming a branch partner with Inlanta Mortgage contact Joe Ramis or Pete Salamone at 262-754-6468 or email them at partner@inlanta.com. Teaching our young people about personal finance is essential to their long term well-being. Oconomowoc High School administrators understand the need to educate our youth about personal finance and each year organizes its Reality Store Program to give kids a little dose of the reality that awaits them. The Reality Store Program walks the kids through decisions that will affect their personal finances such as college, careers, transportation and the decision to purchase or rent a home. This program was designed to engage and maintain the interest of each of the 370 students who participated. Inlanta Mortgage loan consultants, Patty Napgezek and Kristine Steinbach, were excited to help the students with their personal housing decisions. The women calculated each student’s debt-to-income ratios and helped them determine if they had enough money left after college loans and auto payments to purchase a home. The overall simulation was very realistic. Patty and Kristine are both licensed mortgage loan professionals and have been helping customers with their home financing needs for many years. For further information on the Reality Store program or for home financing advice (including refinancing options), contact Patty Napgezek at 262-490-9050. Inlanta Mortgage, based in Brookfield, Wis., is a proud partner of Habitat for Humanity of Waukesha County. For several years, Inlanta Mortgage employees have raised funds for this local charity and are delighted to be the Title Sponsors of this year’s 3rd Annual Wine Tasting Event. Habitat for Humanity of Waukesha County depends on the generousity of Waukesha County community members and organizations. 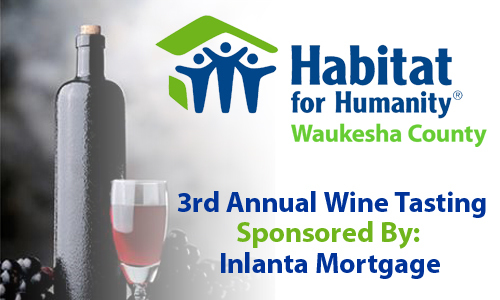 Each year, our local chapter of Habitat holds a Wine Tasting and Silent Auction event at the Loft at Cedar Ridge in Waukesha, Wis. This year’s event is Sunday, October 14th from 2:00PM to 5:00PM. The talented chefs at Waukesha County Technical School volunteered their culinary expertise for the event and will be hosting a chef-carved turkey station, serving exquisite summer rolls, and much more. There will be a variety of delicious wines to sample and a silent auction – all before the Packers square off against Houston Texans. Items in this year’s auction include diamond jewelry, a spa package, Harley Davidson Museum tickets, Pabst Mansion Tours, a number of restaurant gift certificates and passes to Wisconsin Dell’s theme parks. All proceeds help Habitat assist more Waukesha residents achieve the dream of home ownership. A number of Inlanta Mortgage employees will be in attendance and welcome the opportunity to connect with Waukesha County community members at this event – a perfect day for food, fun, and friends! Inlanta Mortgage provides loan officers with a professional website, state-of the-art loan origination software, help desk support, tracking systems, e-mail, customer relationship/database management tools, and access to a secure instant messaging system. Inlanta Mortgage was a proud recipient of Mortgage Technology Magazine’s Top 25 Tech Savvy Lenders Award in 2010, 2011 and most recently in 2012. Inlanta Mortgage is a multi-state mortgage banker based out of Brookfield, Wisconsin. NMLS# 1016. We are proud to be a recipient of a 2012 Top Workplace Award. We are pleased to announce that we were named to Mortgage Technology’s 2012 Top Tech-Savvy Lenders List for the third year in a row. The Top Tech-Savvy Lender List list applauds lenders that have “demonstrated a commitment to using technology and regularly implementing new innovations to produce marked business improvements.” Inlanta Mortgage’s award winning technology is just part of the comprehensive branch support platform enjoyed by our branch partners. One of the technological features Inlanta prides itself on is a newly redesigned intranet that incorporates both corporate and department-level blogs. The Inlanta intranet, or Inlantranet, enables loan officers to quickly see changes in rates as well as up to date turn times for our processing, underwriting and funding departments. Inlanta also recently upgraded its server capacity, increasing storage and space. Employees of Inlanta also have access to Google Apps suite, which allows them to better communicate and share information through email, documents and calendars.